A Bloody Roman (in the words of its creator, Chef Chris Cosentino) is “more than a drink… a first course all by itself” and “an excellent hangover cure”. We decided that the days immediately following the end of Oktoberfest, aka sixteen days of non-stop beer drinking, are a very appropriate time to post our adaptation of this craft beer cocktail. What is a Bloody Roman? It starts with one of Chris’ favorite chefs – Chris Cosentino (cool people seem to be called Chris:). He is a chef and co-owner at Cockscomb in San Francisco (formerly Incanto). His first book, Beginnings: My Way to Start a Meal has been one of our favorites for a few years now. It contains recipes for some of the most creative appetizers ever, the combinations of flavors are bold and sooo tasty. When said book had just come out, Chris Cosentino was invited to prepare a guest chef dinner at Frasca in Boulder, CO. Chris’ boss at the time went, Chris couldn’t as he had to hold down the fort at the Stanley in Estes Park. But, his boss brought him back a signed copy of the book, such a kind and a special gesture. The Bloody Roman is one of Chef Cosentino’s meal starters included in the book. It does remotely remind one of a Michelada or a Bloody Mary, but it is neither and its consistency is waaaay thicker. Like a gazpacho. When you sip on it, it does feel more like a meal than a drink. 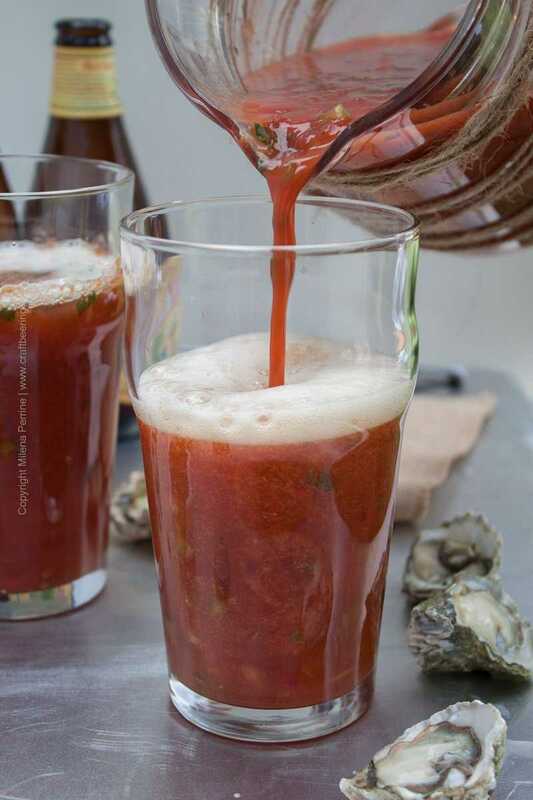 The original Bloody Roman as created by Chef Cosentino has ingredients that can easily lead you to believe that you will be making a high profile gazpacho, but then he adds beer. And sweet oysters – either Kumamoto or Kushi are recommended (we bought Humboldt Gold Kumamotos). Some ingredients are also hard to find for ordinary residents of an average American town like us (for example chile threads used for the garnish, Aleppo pepper and Cabernet vinegar). We have modified the original Bloody Roman only slightly. First and foremost, we scaled down the recipe (we really didn’t need six pint glasses worth of it and suspect that many people might not either). Second, we adjusted the original ingredients just a tad, so that you can actually get them all in one shopping trip to a grocery store with a well curated assortment. Third, we prepared the heirloom tomatoes differently (used a blender instead of a food mill, resulting in a smoother texture). The one thing we didn’t quite solve for any aspiring Bloody Roman drinker and hangover fighter is figure out how to schedule the timing of said grocery store trip so as all the ingredients are already purchased and available as soon as one wakes up with a hangover. This one proved elusive. Back to the Bloody Roman – the ingredients are heirloom tomatoes, parsley, capers, Fresno chiles, shallot, pickled peppers (we got a miniature sweet variety slightly different from what Cosentino recommends), green olives, serrano chiles, fish sauce, oysters, salt and pepper, Anchor Steam® beer and the aforementioned hard to find ones (Aleppo pepper, chile threads and Cabernet vinegar). 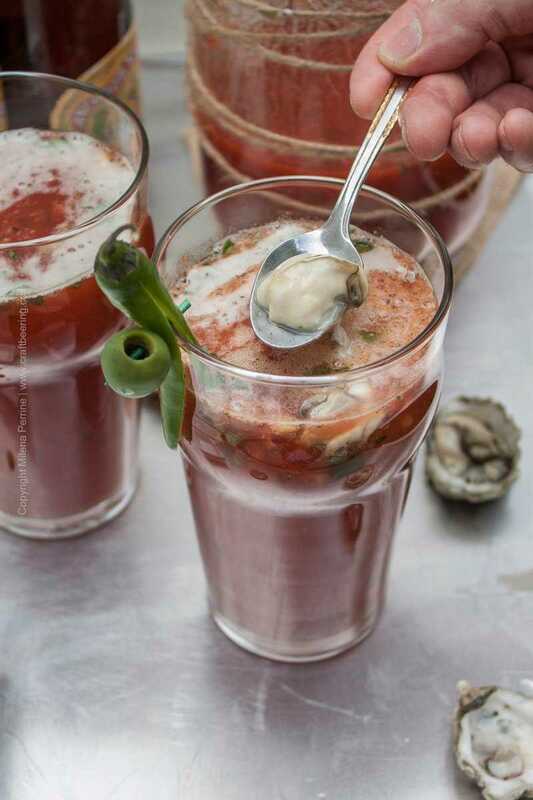 To make a Bloody Roman, one prepares the same name mix with pretty much most of the ingredients listed, then grabs a pint glass, places two olives at the bottom and pours 6 oz of the iconic to San Francisco Anchor Steam® beer. Next, the mix is added and the shucked oysters are gently placed on top. The drink/meal/hangover cure is then garnished with a green olive, serrano chile and chile threads (not shown in our pictures). Let’s just get it out of the way. We both did not particularly like tasting the bitterness of Anchor Steam® in the Bloody Roman. Even though the beer is dubbed well-balanced, there is actually a pronounced hoppy bitterness to it and the maltiness takes a back seat. Drinking Anchor Steam® on its own is delightful – it is crisp and refreshing. The style of beer is called California common or steam beer, fermented at ale temperatures but with lager yeast). When simply enjoying a pint of it it does feel somewhat balanced, but in the Bloody Roman the bitterness overpowered the symphony of other flavors. I guess it all depends on your personal affinity for bitterness and where you want to encounter it. We both thought that the cocktail would taste better if something with a sweeter flavor profile is used. Like a Vienna lager or true to style Munich Helles or a brown ale with markedly malty character. That is just what we thought. It was however a very interesting craft beer cocktail to try out and the Bloody Roman mix itself is beyond intriguing. We are all for the flavors in it and the crunch it packs. I’ll say it again – boarder line gazpacho. We’d both fancy having it as part of an oyster shooter. Imagine – a shot glass with a smallish oyster in its liquid and just over an ounce of the mix. Yum! 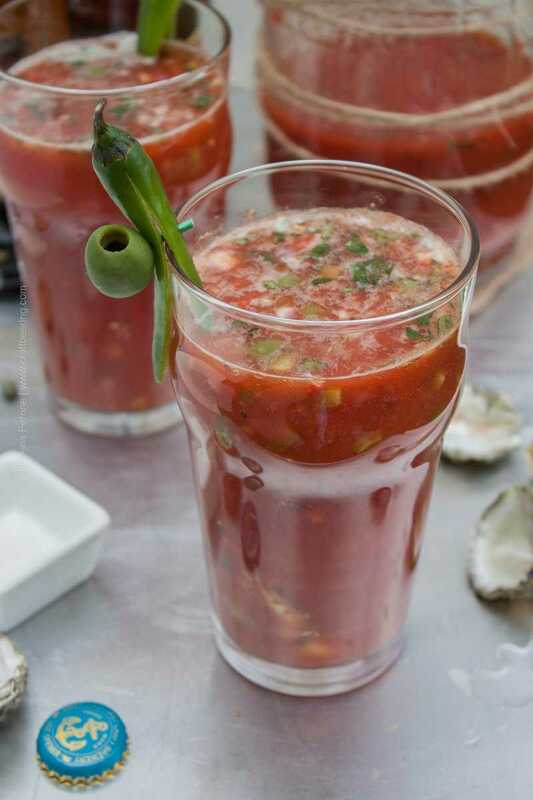 Bloody Roman was created by Chris Cosentino as a drink/appetizer/hangover cure hybrid. 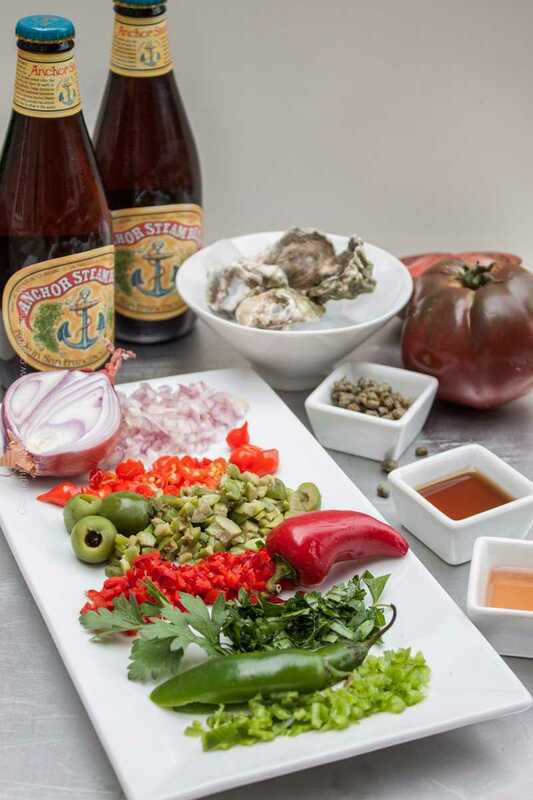 It includes West coast oysters and the iconic San Francisco Anchor Steam beer. This is an adaptation of the original recipe - scaled down and with a few hard to find ingredients modified. To prepare the Bloody Roman mix, start by peeling and removing the seeds from the tomatoes. If you have a food mill or a food milling attachment to a stand up mixer, cut the prepared tomatoes in chunks and run them through. If you don't use your blender. To the tomato liquid add the rinsed and chopped capers, shallot and Fresno chile, (optional: two finely diced green olives) pickled peppers, fish sauce, vinegar and parsley. Taste and season with salt and pepper. In two pint glassed place two green olives each and top off with 6 oz of beer. Add the Bloody Roman mix on top of the beer and carefully slide two oysters per cocktail (if you like the juice, add that too). Garnish each glass with a green olive and a serrano chile and enjoy. Whoa! This packs a punch of flavor! I love gazpacho so I’ll most definitely be a fan of this! Oh, and I agree….all the Chris’s I know are cool people! Lol! Chris named people rock:) To gazpacho season next year! Thank you Jay, will do! Wow! What an interesting cocktail!! It definitely is like a meal with all that goodness packed in there. I’ve definitely never had anything quite like this, but would give it a try for sure 🙂 How awesome that Chris got a signed copy of the recipe book! If this recipe is any indication of what’s inside, I’m sure it’s pretty great! Have a lovely week, you guys! I have never heard of this cocktail. Sounds delicious with a kick. Beautiful photography! 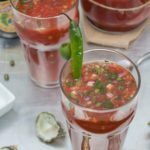 This sounds like a perfect brunch cocktail :). I love that it’s like drinkable gazpacho! I need your secret to getting rid of hangovers quickly; I seem to get a hangover just thinking about alcohol! Happy Saturday! Thank you Kelsie! Lol, I used to say that I gain five pounds just looking at ice cream! Will hurry with that post then!